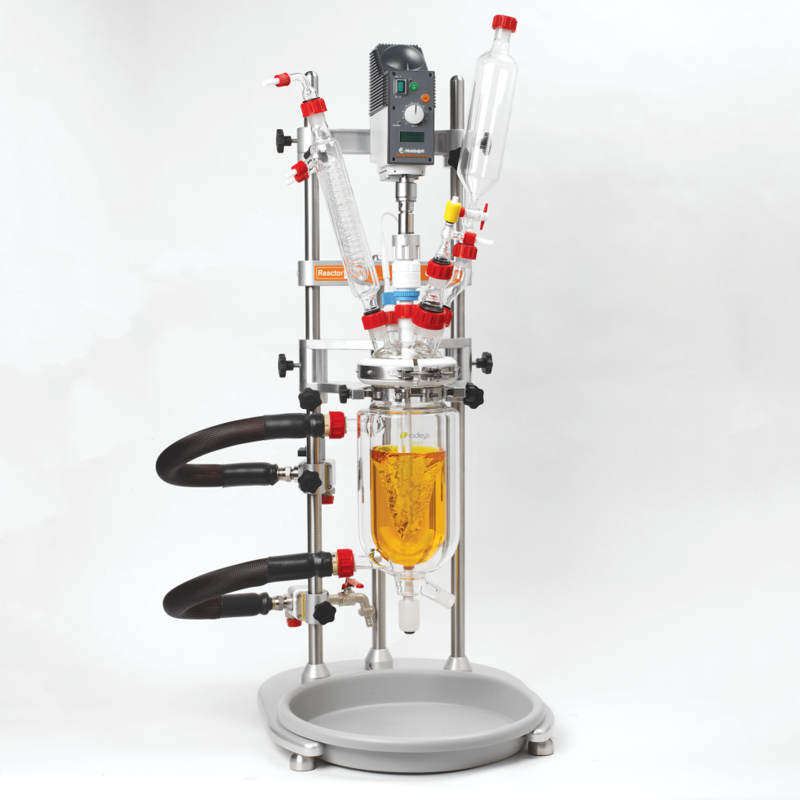 Reactor-Ready™ Lab Reactor – Inspire Scientific Co., Ltd.
Reactor-Ready is designed as a universal reactor work station with a range of easily interchangeable vessels from 100 ml to 5 litres which can be configured to suit the chemistry and scale needed for each project. 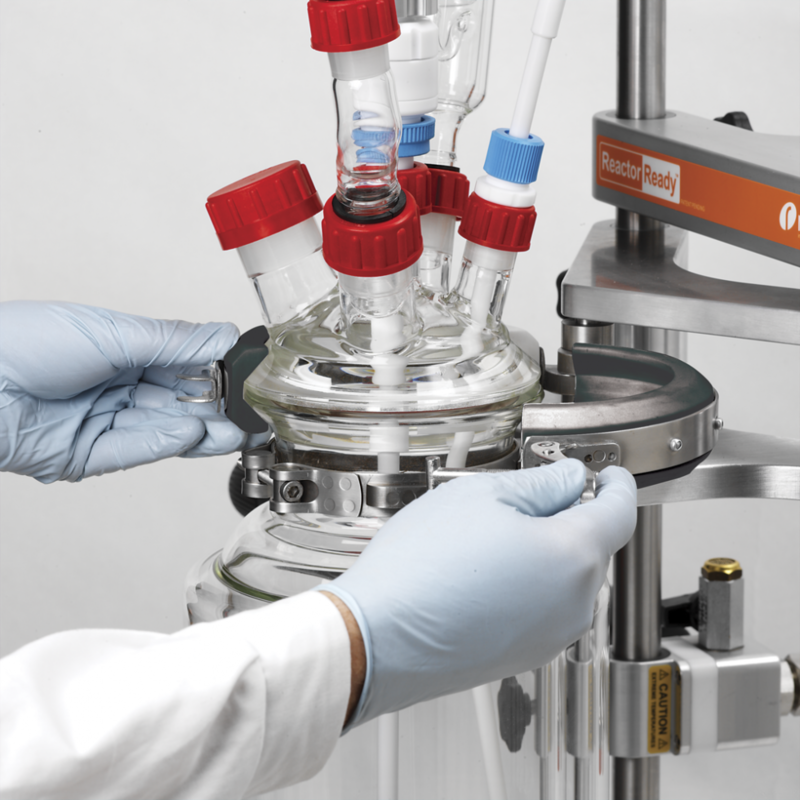 Easy to use, this one unique framework can replace many, saving money and fumehood space. Innovative hose manifolds allow easy thermofluid drain down. Optional software allows you to log and control stirrers, circulators, balances, pumps, temperature sensors and other devices. 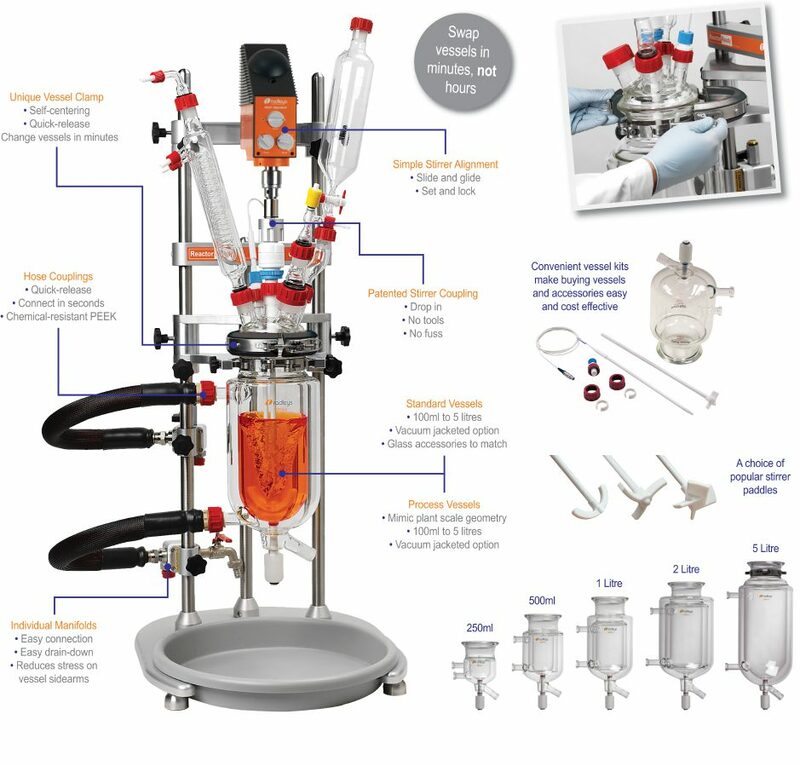 Range of single and vacuum jacketed vessels from 100 ml to 5 litres. Unique clamp design allows vessel to be supported and clamped by a single operator in less than a minute. Use the same clamp to hold all vessel sizes; plus the vessels remain supported even when the clamp is unlocked. Reactor-Ready uses an innovative support collar fitted to the neck of each vessel, which allows the vessels to be swapped in and out of the Reactor-Reactor core like a cartridge. The stainless steel collar locks securely into the support plate on the framework and allows the vessel to remain supported, even when not clamped. Vessel exchange is tool free and can easily be undertaken by one person. Patented drop-in stirrer coupling engages easily without the need for tools. Simply lower the stirrer coupling to engage with the stirrer guide below. The stainless steel stirrer coupling will fit in any standard stirrer chuck. The non-slip design ensures powerful stirring up to 500rpm, or 800rpm for short periods (subject to motor selected). Reactor-Ready is offered with a choice of PTFE Stirring Shafts: Anchor, Retreat Curve and Turbine or Propeller styles. 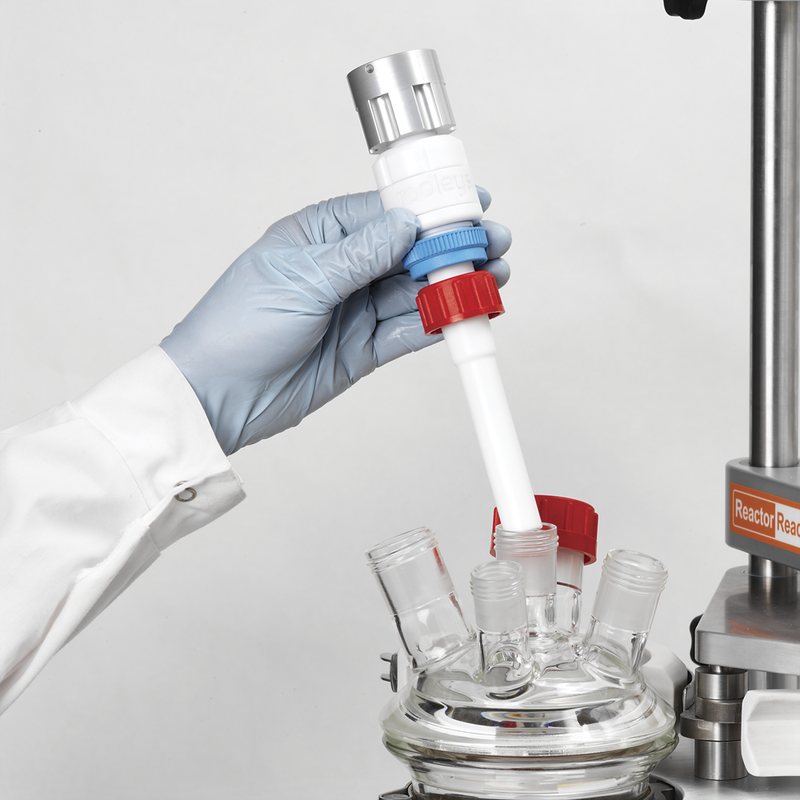 PTFE Anchor Stirring Shaft is included with all standard reaction vessel kits. PTFE Turbine Stirring Shaft is included with all process reaction vessel kits. I-beam allows the stirrer drive to be raised or lowered without needing to remount the stirrer. Adjustable safety stop collars located below the I-beam allow the user to lower the stirrer motor to a set position for ease of operation and safety. 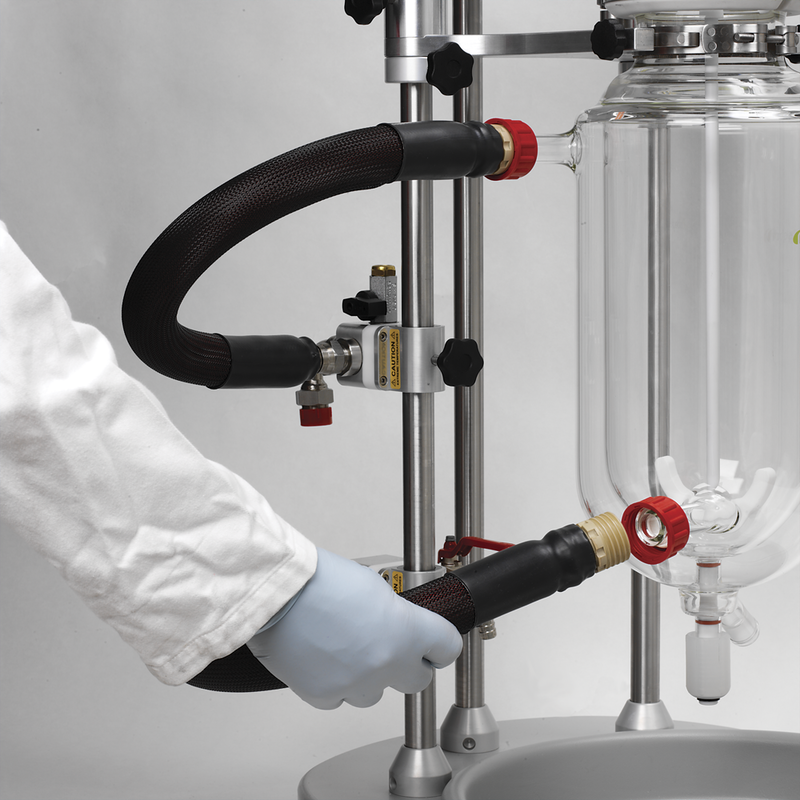 Reactor-Ready accepts all leading brands of motor or air-powered overhead stirrer with support rods up to 16mm in diameter. 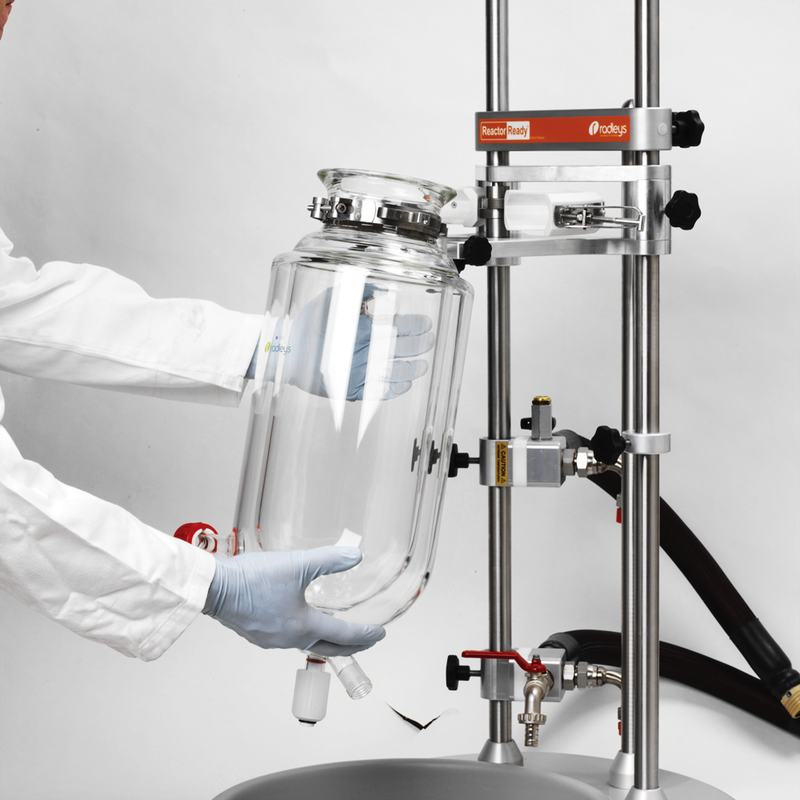 The Reactor-Ready’s PTFE stirrer guide screws directly on to the glass lid and features a unique extended support which provides whip-free agitation even at high speeds. 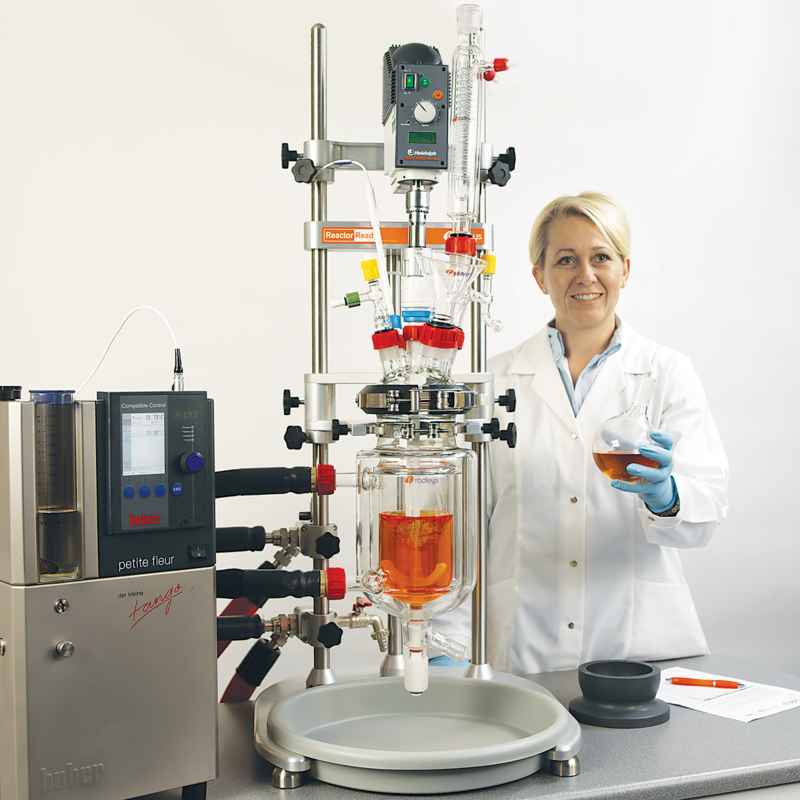 The stirrer guide is chemically inert, gas tight and suitable for work under vacuum. Operates over the temperature range -70˚C to +230˚C. 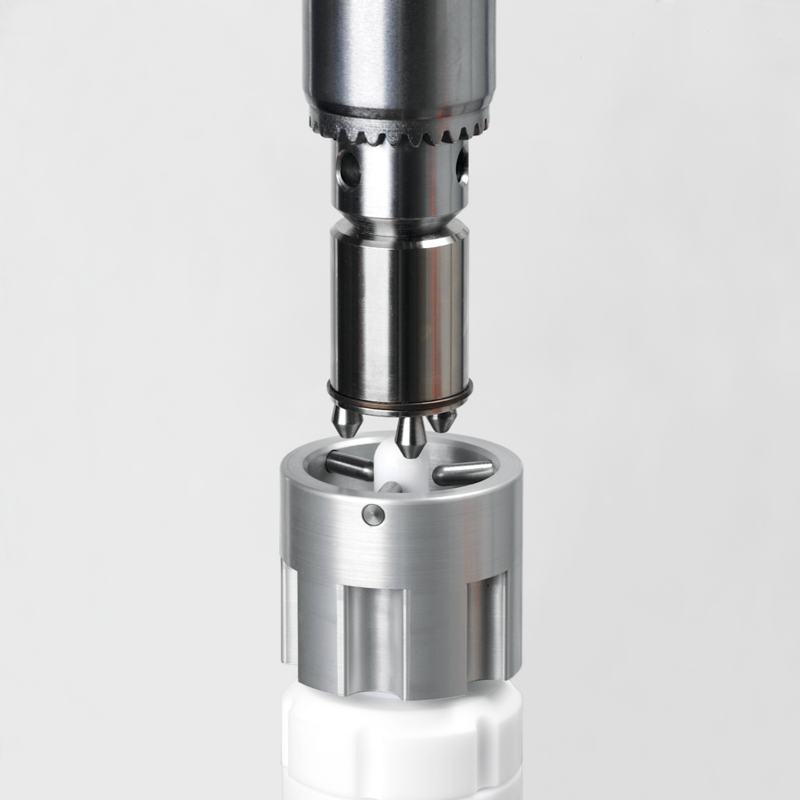 Quick release, screwthread design allows rapid exchange of vessels without the use of tools. Simply tighten by hand for a leak tight seal. PEEK with Viton O-rings ensures all wetted parts are chemically resistant. Lightweight, metal free design prevents chipping and minimises strain on the glass fitting. All hoses have a 12mm ID, maximising thermofluid flow and heating/cooling performance. Low thermal conductivity of PEEK reduces frosting when cooling. The inlet and outlet hoses from the Reactor-Ready vessel connect to manifolds attached to the support rod. 1. Supports the hose running from the vessel, thereby eliminating stress on the glass sidearm. 2. Allows thermofluid drain down which provides a quick and clean method of removing the thermofluid from the vessel jacket when changing vessels. Opening the drain tap on the (lower) inlet manifold allows drainage to an external reservoir.